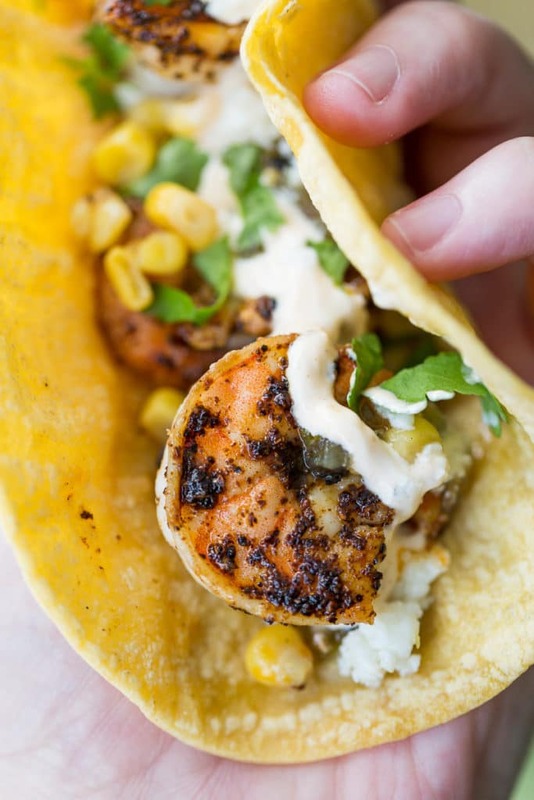 Spicy shrimp tacos are even better on toasted corn tortillas! Add your own toppings and finish it off with a fiery sour cream. I think that I could eat tacos every day. I really do! Something about the combination of flavors and textures just hits every happy button in my brain. Shrimp tacos are ridiculously easy to make. I mean, all you have to do is throw the shrimp in the pan for a few minutes, and BOOM! You’re practically done. While you’re here, make sure you check out the Frontera Wines Game Day Sweepstakes! Enter to win a 55-inch HD TV for a fantastic view of all your favorite sports games. A giant TV makes shrimp tacos taste even better, I think. 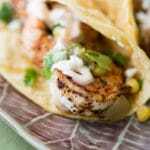 Since this recipe is so quick to make, it makes these shrimp tacos particularly convenient for parties. If you have a big game party coming up, you’ll want to save this recipe. You won’t want to miss the action, and a recipe that’s ready in a flash will get you out of the kitchen and back in front of the TV, pronto! Another thing that’s nice about using shrimp is that (because it’s seafood) it pairs well with a good white wine. 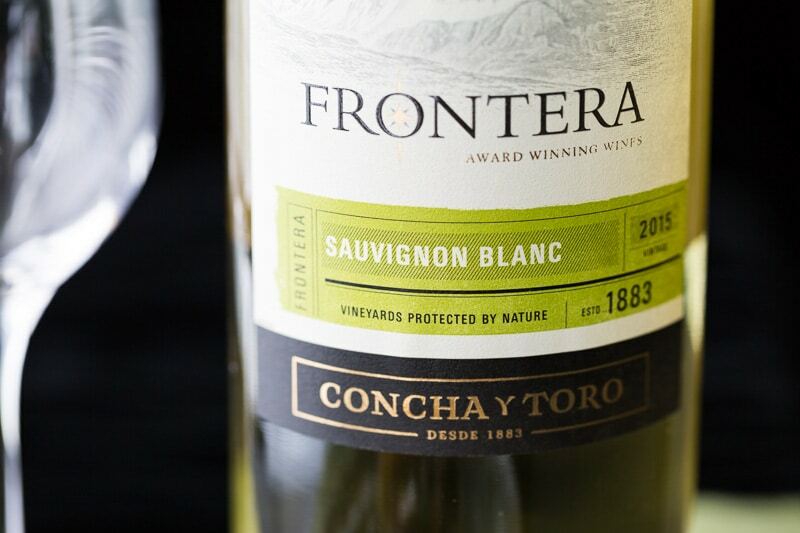 Frontera Wines Sauvignon Blanc makes an excellent pairing. 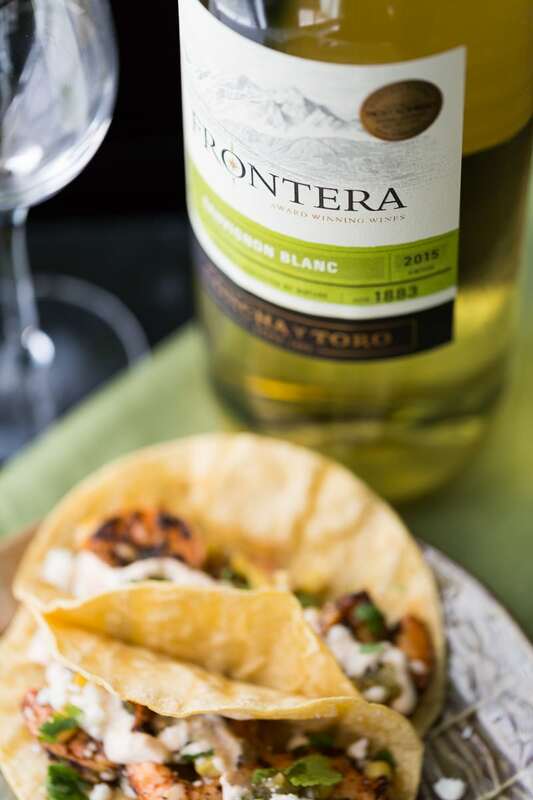 You can make every moment tasty with Frontera Wines, because you can choose from Sauvignon Blanc (pictured), Chardonnay, Cabernet Sauvignon, and Cabernet Sauvignon Merlot. 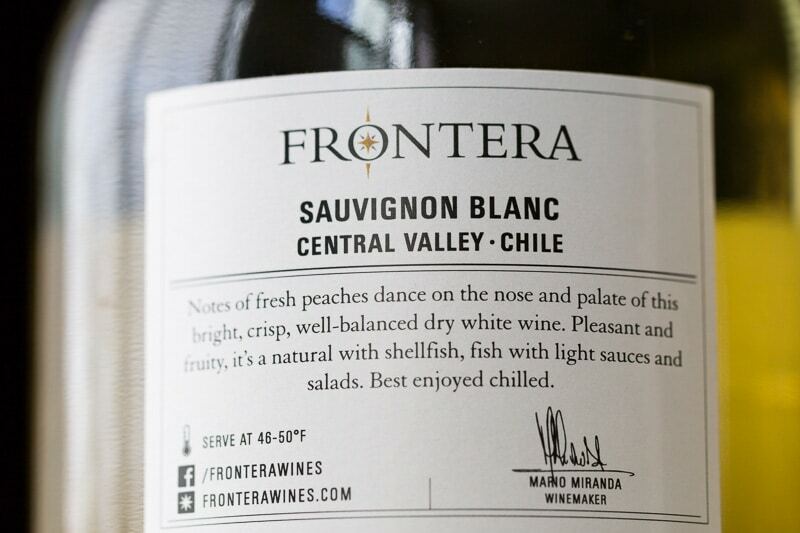 This wine has notes of fruit and a citrus aroma, with a fresh coolness that complements seafood. To make your preparation process streamlined, I recommend that you get your toppings ready to go first. Pop them in the fridge to await the rapid arrival of the cooked shrimp. You’ll preheat the pan and toast the tortillas in the oven while the shrimp are cooking. Then, it all comes together quite quickly. 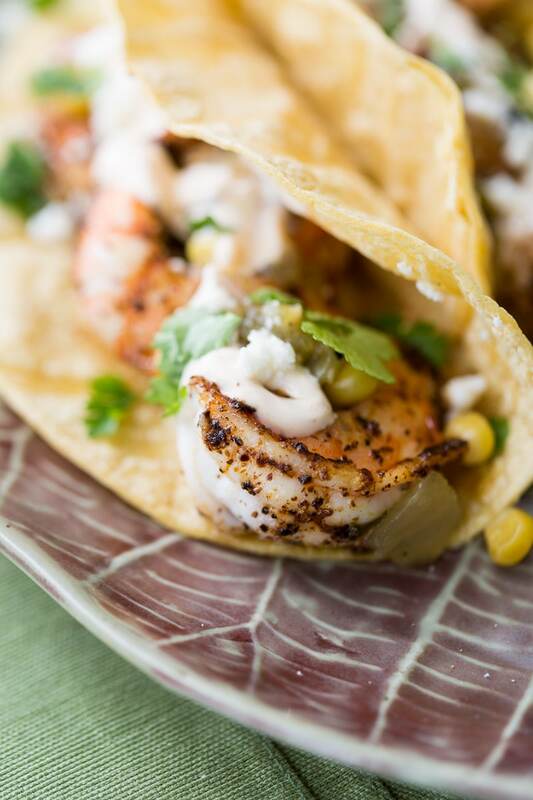 You can top the tortillas yourself, or lay out the toppings and shrimp for people to make their own to their liking. In fact, if you set up a table in the viewing area, no one has to miss a moment of the game. 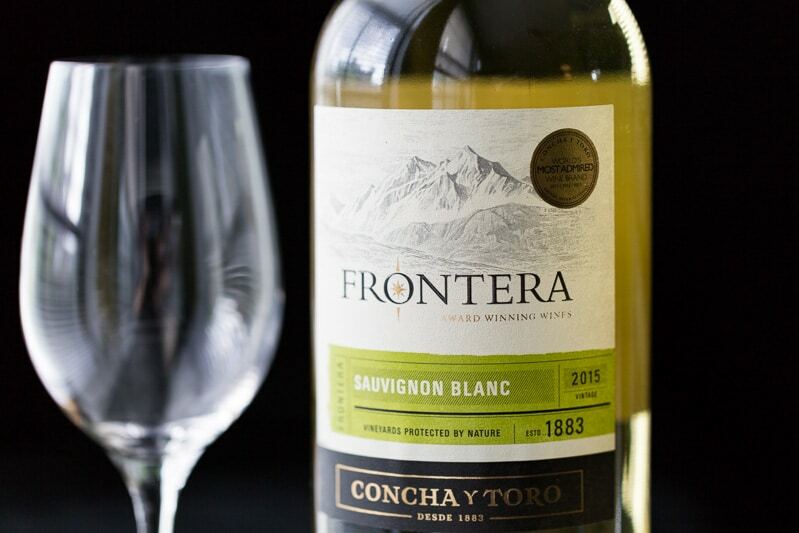 Don’t forget the wine glasses and the Frontera Wines! Casual occasions like game-watching parties are suitable for the laid back look of stemless wine glasses, so feel free to use the vessel of your choice. Seafood quality is important. Go for wild-caught if you can, or look for sustainably farmed shrimp if wild-caught is unavailable or too pricey. I love corn tortillas for their unique texture and flavor, but you can substitute flour tortillas if you like. Flour tortillas can be toasted or they can simply be warmed; it’s up to you. 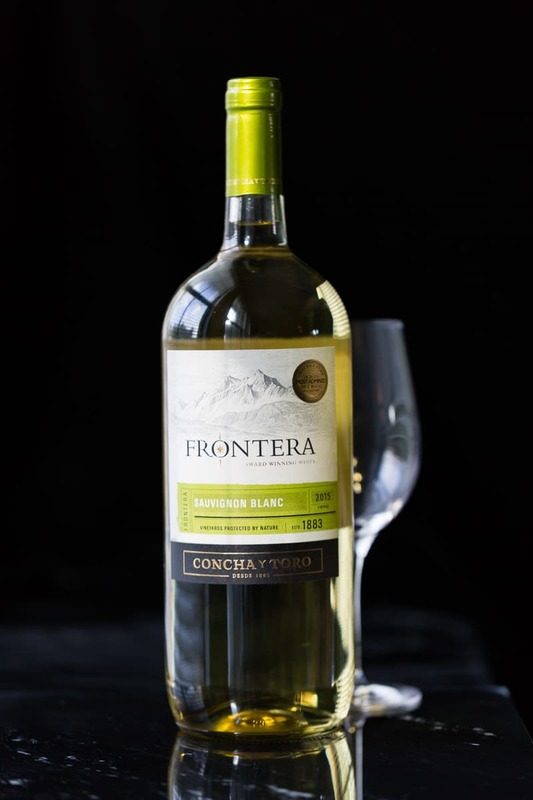 Give your Frontera Wines Sauvignon Blance time to chill before serving. 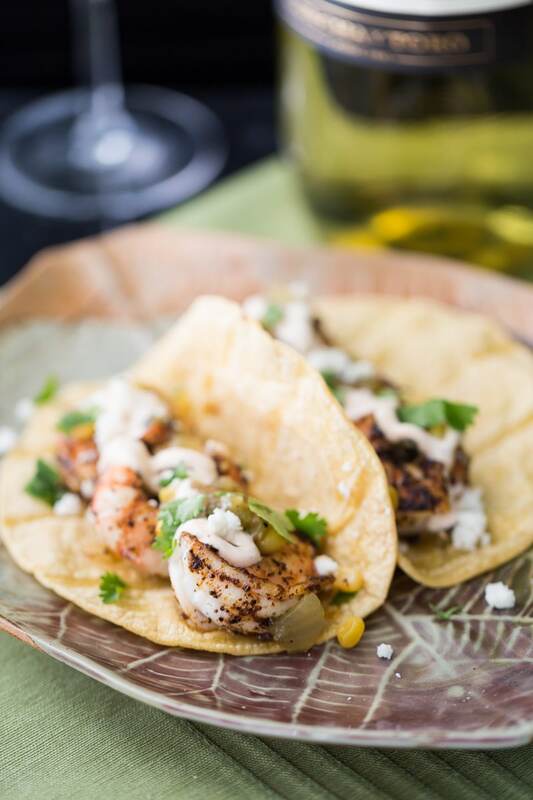 A refreshingly chilled wine is a pleasant contrast to something warm and spicy like these shrimp tacos. Make the spicy sour cream and get your choice of toppings ready to go. Preheat a large nonstick frying pan over medium heat until a drop of water sizzles away when dropped in the pan. Place the corn tortillas directly on the rack in a cold oven. Turn it on and set it to 400 F.
Put the raw shrimp in a bowl with the olive oil. Sprinkle on the chili powder. Toss to coat the shrimp evenly. Put the shrimp in a single layer in the hot pan. Cook until firm and no longer translucent, about 2 or 3 minutes. Remove the corn tortillas from the oven. They should be hot and slightly stiffened, but not crunchy. 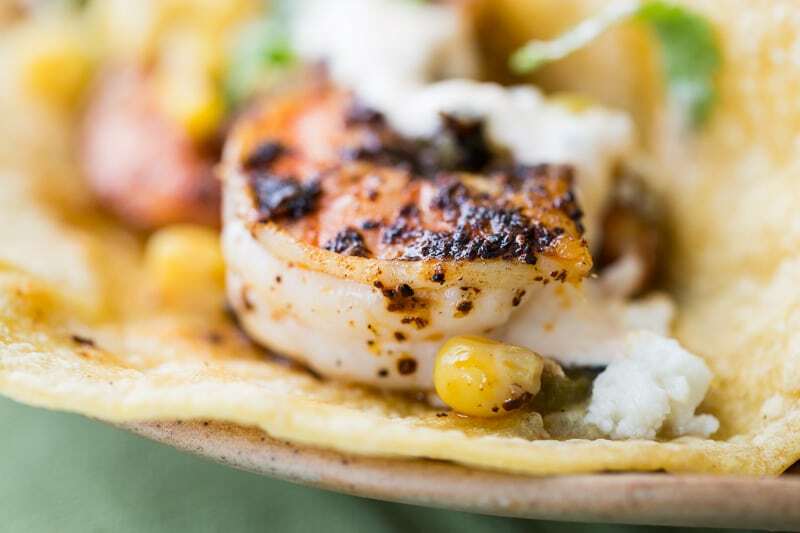 Distribute the shrimp on the tortillas and top with your preferred toppings. Serve immediately. 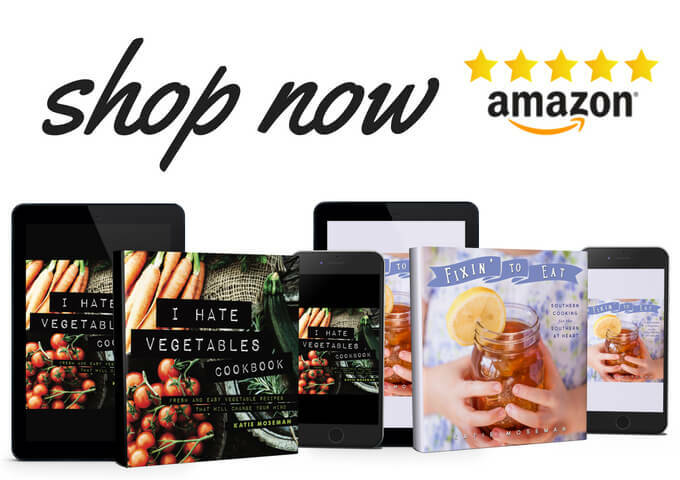 If you like tacos, try these recipes! Oh my word. These look soooooooo good. Since I’m allergic to shrimp, I’d substitute chicken. LOL, I’d also get my son to cook. PERFECT! I really like tacos too, but I actually have never had a shrimp taco! I love shrimp though, so I”m not sure why I haven’t ever had one. Yours look so very delicious and I am definitely going to try making these! Love, love shrimp tacos! It’s always so packed with flavor and it’s so good when the shrimps are fresh. I love that you can easily make these. I’m keeping the recipe! Seafood tacos are one of my favs. I love the lighter flavor and it allows me to add a ton of avocado or guacamole on top. This looks so good! I think my husband would really enjoy these. I can’t wait to make them for him he will be so thrilled! I like that you toasted the tortillas. That makes all the difference in the world to me. 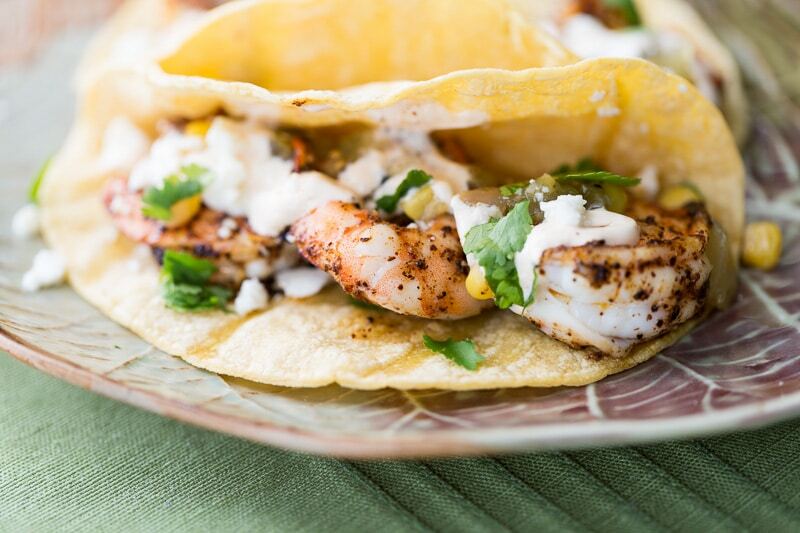 Your Spicy Shrimp Tacos look really delicious! We love tacos in our house because they are really easy to make and there are so many tasty combinations you can try. I love tacos and I love shrimp! This recipe has both of my favorites so it is a definite winner in my book! Thanks for the recipe. I am including this in my menu plan for next week, and I am also grabbing a bottle of Frontera Sauvignon Blanc at the store. Those look like a very balanced and healthy meal. Love how you added cilantro and chili powder, since I use those ingredients in my cooking all the time. These tacos definitely sound like the perfect to-go meal! This is a delicious recipe, Katie! Thanks a bunch for such a palatable recipe, I will definitely prepare it soon.